If you want to make healthy snacks for your family at home, don't worry about those expensive gadgets like a juicer or a dehydrator. A raw food chef shows you how to make fresh juice, fruit leathers, kale chips and almond milk at home for less that it costs to buy them at a health food store and without any costly appliances! Raw food expert April Ree believes healthier snack and beverage choices can be made without relying on expensive gadgets you don't own. She turns to appliances most of us already own, including a typical blender and an oven, to make satisfying snacks and drinks for the whole family. Want to make fresh juice, but don't have juicer? "You don't have to have an expensive juicer," says April. "You can use whatever blender you have." April makes her own juice she calls Sweet Mama's V8. She puts 8 different vegetables and one fruit, plus some water, into her blender to start. Blend it up, and then use a cheese cloth or nut milk bag to strain out the pulp. You can get a nut milk bag from a health food store for about $1, and you can use it over and over again. This step removes the fiber so the vitamins and nutrients from juice can be absorbed by your body. Next, April shows how to make fruit leather, or natural fruit roll ups, without a dehydrator. She adds the pulp from her V8 juice back to the blender along with a little juice and some blueberries. Then she spreads a thin layer of the mixture on a cookie sheet covered with foil. Instead of buying a dehydrator, she says you can use the oven and set on the lowest temperature with the door propped open. It will take a few hours to dry out. 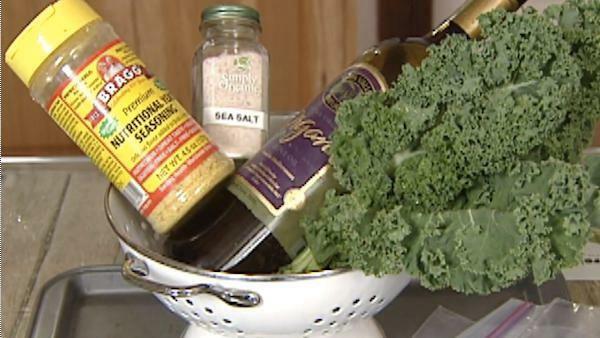 Another healthy snack you can make at home is kale chips. Strip the leaves right off the stem. April adds the leaves to a ziploc bag with some olive oil, lemon, salt and some nutritional yeast, which gives a cheesy flavor. Spread them on a cookie sheet covered with foil. Set the oven to its lowest temperature, prop open the door and bake the leaves until they're crispy. Another healthy food you can make yourself is almond milk. Almond milk is a great alternative to traditional milk, but it can be expensive at the grocery or health food store. It only takes two ingredients - almonds and water! Plus, almond milk from the store can have preservatives and sweeteners that aren't so healthy. To make almond milk, April starts by soaking her almonds for 24 hours in the refrigerator, changing the water a couple of times. The soaking allows the almonds to expand and activates the enzymes inside. Once the almonds are drained, she recommends using clean water to rinse them and then putting them in the blender with some fresh water. You don't have to have a fancy blender - any blender will do. Blend it up, starting off slow and slowly increasing the power. Strain the mixture with a nut milk bag or cheesecloth. Once blended, put the homemade almond milk in a sealed container, refrigerate it, and enjoy it while it's fresh for up to two weeks. Not only is this inexpensive, but it's quick to make! April suggests experimenting with the simple recipe by trying hemp seeds, brazil nuts, or macadamia nuts. You can also sweeten and flavor it by adding dates, maple syrup, vanilla, cinnamon or even raw cacao. The pulp from the almonds can be used to make vegan muffins. One of April's recipes, carrot cake muffins, relies on almond pulp and carrot pulp from the blender. She also uses chia seeds and hemp instead of traditional flour, and adds maple syrup, flax, and a coconut mixture. For more from April, visit OceansOfAbundance.com.